Have you ever observed a fly trapped behind your car’s windshield, futilely fighting to find an escape? All of your car’s side windows might be wide open, but it never occurs to that frustrated fly to try anything different than continuing to search for a way through an invisible, impenetrable barrier. You can’t help but feel sorry for such a fly and, if you are bent towards mercy, you might try to swish him towards an open side window. Most flies, however, will resist your effort to help them, and your attempts only make them more determined to do the impossible. Eventually, they’re lying dead on your dashboard. The pity we all feel for such frustrated flies is analogous to what followers of Christ feel every day for everyone else. We observe people’s recurring misery and frustration, and we know full well that so many of their problems could be resolved if they would only submit to Jesus. He would forgive them, open their eyes and set them free, fill them with His Spirit, and teach them His ways. We try our best to let unbelievers see the ways that Jesus has changed us. We even tell them—if we dare—about the solution we’ve found, hoping to improve their temporal and eternal state. But alas, we’re often hated for loving them. And they continue struggling to fly through windshields. Sadly, we know how it will all end. And fools hate knowledge?” (Prov. 1:20-22). God is calling everyone, all the time, to turn from their foolishness. And surely He shakes His head every day, wondering at how most people use the free will He’s so graciously granted them. Although many have identified all the common problems, they’ve rejected His solution. Two of those common human problems are racism and prejudice, topics we’ve been hearing a lot about lately. Jesus instantly solves both in the lives of those who turn to Him. Before we look at how Jesus does that, it would be worthwhile to first consider what racism and prejudice actually are. In contemporary America, many accusations of racism are groundless judgments. I wonder, for example, how talking heads on TV know my inward reasons for voting for one candidate over another. I’m white, but I roomed with a black man in college. I asked him to be the best man at my wedding. I have black friends. The nonprofit I direct serves very poor people all over the world, including those with dark skin. I have a black foster grandchild. I just hired a black CFO. But I didn’t vote for Barack Obama in the previous two elections because I’m racist? Really? It also seems to me that the very word racist has been recently redefined. By definition, a racist is a person who believes that a particular race is superior to another race. Racism is not observing that certain people are of a certain race. It is not disagreeing with someone who happens to be of another race. It is not making an informed character appraisal of someone who happens to be of another race. Yet people who do those things are often labeled as racist. For example, people are labeled as being prejudiced if they express a wariness regarding random people of another race. But what if that person has experienced only repeated negative experiences with members of that race? Such a person is not actually being prejudiced. Rather, he is being reasonable, having been conditioned by his previous experiences. But of course, if he was to say about a a member of another race whom he randomly encounters, “That person is no doubt just like the others of his race with whom I’ve had negative experiences, that is a “pre-judgment.” That is not based on (sound) reason. That is prejudice (and racism). If you are black, and all your life you’ve only experienced harassment and injustice from white police, how could you not be wary of any and all white policemen? It would be unfair to accuse you of being racist or prejudiced. You are being reasonable. The same goes if you are a white policeman, and all your career you’ve only ever experienced disrespect, and several of your colleagues have recently been ambushed by black men, how could you not be wary of black men in the neighborhood you patrol? It would be unfair to accuse you of being racist or prejudiced. You are being reasonable. These two examples are analogous to that of a woman who has suffered abuse at the hands of her former husband. Her wariness of men isn’t prejudice. It is caution based on reason. However, if such a woman were to say, “All men are jerks,” that would be unreasonable. That is prejudice. The wonderful thing is that Jesus can cure racism, prejudice, and dissension. Racism and prejudice can be cured instantly, as there are only two parties involved, God and the person who is racist or prejudice. Curing dissension is obviously not guaranteed because three parties are involved, but the likelihood for a cure certainly increases when Jesus is added to the equation. First, by impartially condemning every rebel. 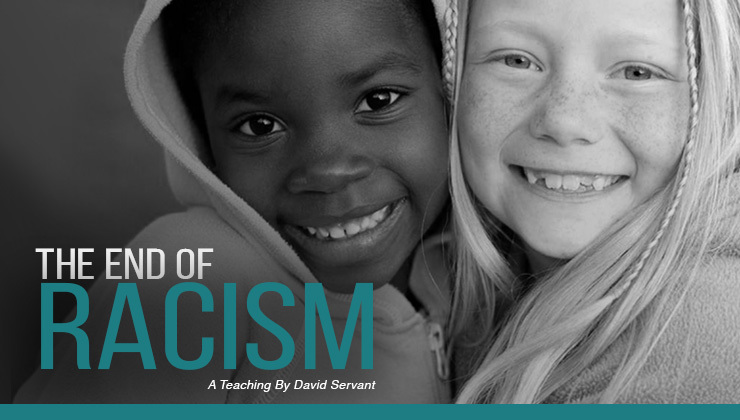 Both racism and prejudice are rooted in pride, but the truth of the gospel is quite humbling. We’re all sinners. There is no inherently morally superior race or person. The playing field has been leveled. And we’re all worms. Second, by impartially offering forgiveness. The gospel extends equal access to salvation. Jesus loves every member of every race. He bore the sins of everyone. And fourth, by empowering His children. Jesus fills believers with His Holy Spirit, and His love is shed abroad in their hearts (Rom. 5:5). That love causes them to love one another, overcoming all former racism and prejudice. Many former bigots can testify of a supernatural transformation they experienced when they came to Christ that caused them to suddenly love those whom they formerly unjustly hated. Moreover, that same inward love provides the potential for the healing of relationships that have understandably been broken by sin. Believers are taught to love even those who hate them, to overcome evil with good, to be merciful, to forgive, and to believe the best about those who they would have formerly believed the worst. All of that helps pave the way for potential reconciliation, even with unbelievers. Jesus works by changing hearts and minds. That is the only way to end racism, prejudice and division. Passing laws to curb them does little good, and it can even be counterproductive, as the discriminators consequently find themselves legally discriminated against. Scripture tells us that one day, neither racism, prejudice or division will plague the earth any longer. That is because the earth will only be inhabited by lovers, people transformed by God’s grace. Only they will be citizens of Jesus’ kingdom when He rules the earth. It is tragic that so many on planet Earth long for an end to racism, prejudice and dissension, but they reject the only proven solution. One of Heaven’s Family’s partners in Rwanda, pastor Deo Gashagaza, is known in his country as a type of Mother Teresa figure. God has used him, perhaps more than anyone else in Rwanda, to bring reconciliation between Hutus and Tutsis since the 1994 genocide during which at least 800,000 Tutsis (and moderate Hutus) were massacred by rampaging Hutus. 45 of the 800,000 who perished were members of pastor Deo’s own family. Pastor Deo has established what are now known as “Reconciliation Villages,” where Hutu genocide perpetrators live together in harmony with Tutsi victims. Such an arrangement was, of course, conditioned upon Hutu perpetrators first asking forgiveness of surviving Tutsi—whose family members they had slaughtered—and upon surviving Tutsis granting them forgiveness. And all of that was, of course, dependent on both perpetrators and victims coming to Christ. It is an amazing experience to visit any of the Reconciliation Villages in Rwanda and witness the forgiveness, peace and harmony that exist among these two ethnic groups that once passionately hated each other. Pastor Deo told Heaven’s Family’s Prison & Rehab Ministry director Bob Collins that he is continually asked by international visitors to explain the secret of getting Hutu murderers and Tutsi victims to live together in harmony. His visitors want to know how they too, can cure the racial problems that divide their own countries. Pastor Deo always explains that the secret is Jesus but, sadly, his visitors rarely believe him. They are always looking for some psychological, sociological, or political explanation. After these things I looked, and behold, a great multitude which no one could count, from every nation and all tribes and peoples and tongues, standing before the throne and before the Lamb, clothed in white robes, and palm branches were in their hands; and they cry out with a loud voice, saying, “Salvation to our God who sits on the throne, and to the Lamb.” (Rev. 7:9-10).